The department has been furnished with modern equipment and machineries as per the requirement of the syllabus of Anna University, Chennai. In all the laboratories and workshops, skilled technical persons are available at any time to train the students. The budding engineers are encouraged to enrich their knowledge by utilizing the facilities and resources of the department. Some of the important features of the laboratories are highlighted here. 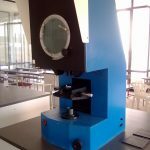 In Strength of Materials Laboratory, students learn to measure the mechanical properties of materials, such as tensile strength, compressive strength, torsional strength, hardness of the materials, impact load etc. from metal bars and bricks to concrete cubes. Computerized Universal Testing Machine is one of the important equipment available in this laboratory. The Working principal and functioning of four bar chain mechanism, slider crank mechanism, governor mechanism, gyroscopic mechanism etc. which are taught to the students theoretically in the class room are demonstrated to them in this laboratory. Vibration characteristics of springs, beams, shafts are also studied. 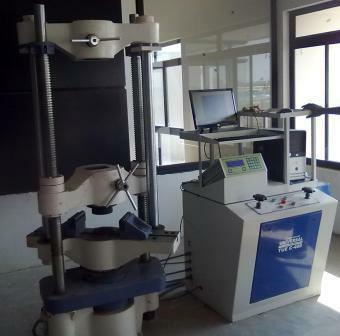 Force transmitted to the foundation, cam profiles and cam jump phenomenon are experimentally learned in this laboratory. Working in a lathe is one of the major requirements of a Mechanical Engineer. Students become skilled at lathe operations by performing turning, facing, thread cutting, knurling, chamfering, axial drilling, eccentric turning, step turning and taper turning along with the use of various tools used for the above operations. 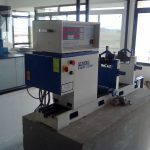 Lathe tool dynamometer which is used for measuring the cutting force exerted on the work piece by the tool in a lathe, is an important device available here. 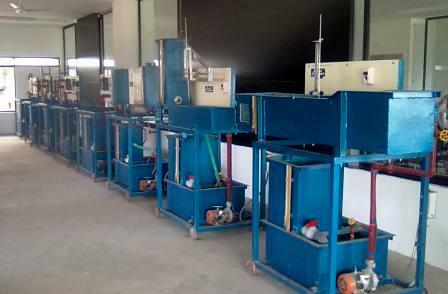 Heat and Mass Transfer Laboratory deals with the experiments related to different modes of heat transfer i.e. conduction, convection and radiation. 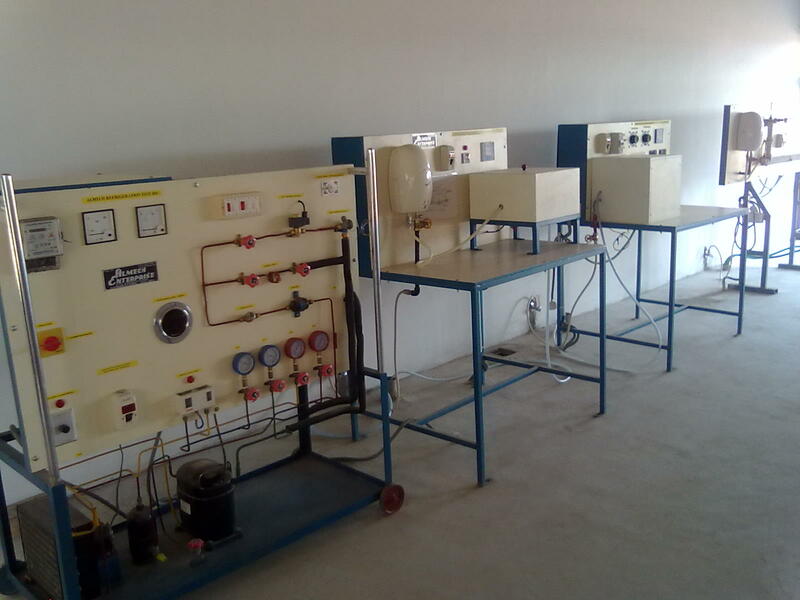 In this Lab, Students become familiar with parallel flow and counter flow heat exchangers, heat transfer in the composite slab, measurement of thermal conductivity, performance of refrigerators and air conditioners and performance of compressors. 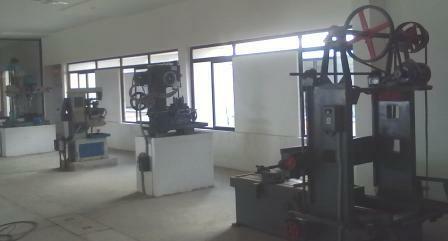 In Fluid Mechanics and Machinery Laboratory, flow through pipes, orifice, mouthpieces, notches etc. are analyzed by the students to measure the velocity of fluid, coefficient of discharge, and coefficient of velocity. 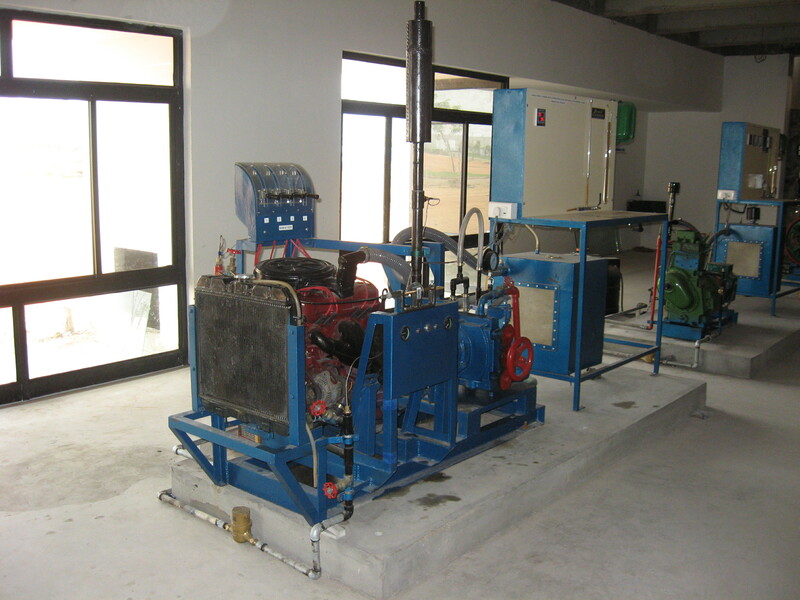 The working principle and performance of hydraulic turbines and pumps are also taught to them. This is the laboratory where the student learns to use and calibrate measuring instruments and equipments. 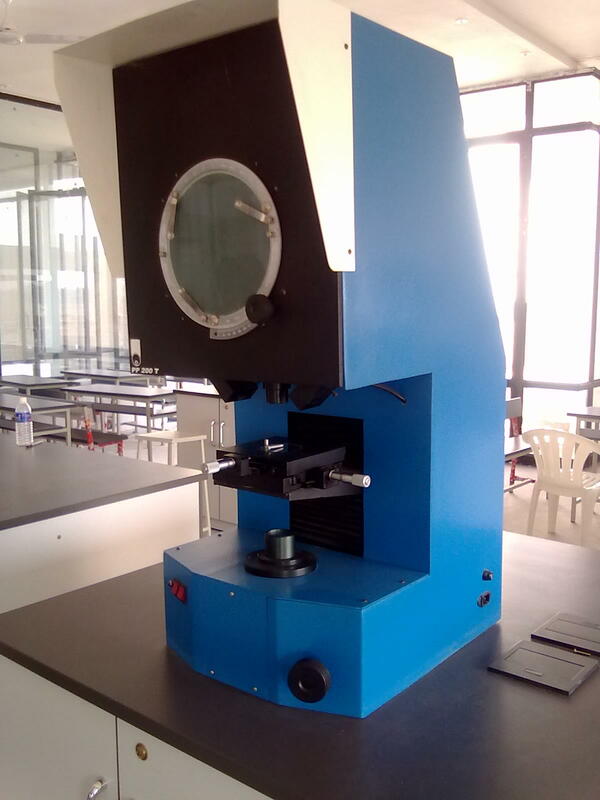 Main equipments in which students gain hands on experience are comparator, profile projector, sine bar, floating carriage micrometer, temperature measurement setup, force measurement setup and torque measurement setup. 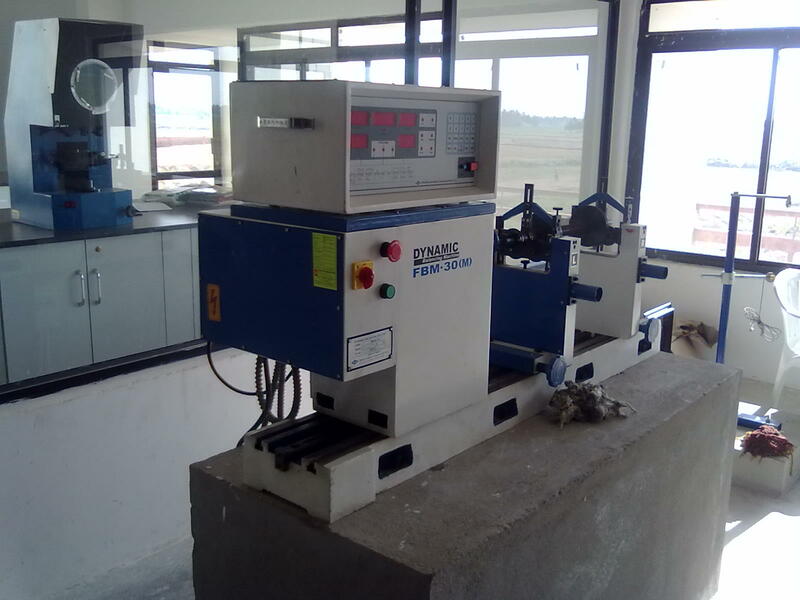 In this lab the performance and emission characteristics of Petrol engine, Diesel engine, Multicylinder engine are determined. The properties of petroleum fuels like flash & fire point, dynamic viscosity and kinematic viscosity are also determined. The cutsection models of two stroke and four stroke engines are used to draw the port timing and valve timing diagrams. The performance of the boiler and turbine are detrmined in the Steam power lab. 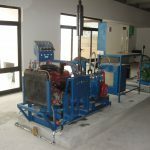 In Mechatronics Laboratory, students learn to design and test the fluid power circuits and to control the fluid power circuits using pneumatic and hydraulic trainer kit. Students also learn to model and analyse basic electrical, hydraulic and pneumatic systems using LABVIEW software. Our CAD/CAM laboratory has been set so as to facilitate the students to create design of components, further enabling them to perform analysis on various parameters through softwares like AUTOCAD, CREO, ANSYS etc. In the Foundry laboratory the fundamental manufacturing process, casting is studied. Student learns how to prepare the mould, the method of melting the metal and how the molten metal is poured in to the mould etc. The candidate becomes famil iar about the tools used in foundry shop, casting allowances, casting defects and methods of eradicating the defects.The process of joining similar and dissimilar metals is studied in the Welding shop. Student gains practical working experience of the arc welding, gas welding and gas cutting, soldering and brazing techniques.Apart from the experiments and exercises on the above laboratories and workshops, a candidate is given training on plumbing work, electrical wiring and wood working in carpentry shop along with the tools and their usage. 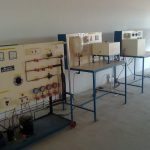 Apart from the exercises students undergo in the above mentioned laboratories and workshops, they are also given training in plumbing shop, electrical wiring, carpentry, sheet metal and smithy shop along with the tools and their usage.